A spice is a dried seed, fruit, root, bark, or other part of a herbaceous or woody plant used in nutritionally insignificant quantities as a food additive for the purpose of flavoring, or sometimes as a preservative. 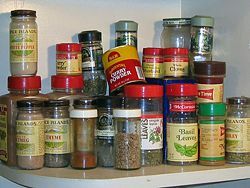 Examples of well-known spices include pepper, cinnamon, and nutmeg. Culinary spices are distinguished from vegetables in that spices are used in small amounts and provide flavor (similar to herbs) rather than substance to food. Some plant parts used for spices may also be used for other purposes, such as medicine, religious rituals, cosmetics, perfumery, or eaten as food. For example, garlic can serve as a vegetable and licorice as a medicine. The terms herb and spice are often used interchangeable. However, some make a distinction based on what part of the plant is the source and the type of plant, restricting culinary herbs to those substances coming from the leafy part of a herbaceous plant, among other differences (Herbert 2006; Spicer and Van Dyk 2003). Through the stimulation of the senses and preservative powers, spices have been treasured for thousands of years and have fostered major trade routes and important cultural exchanges. One of the major consequences of the spice trade was the discovery of the American continent by European explorers. Spices are aromatic plant substances that are added in very small amounts to foods and drinks for the purposes of flavoring. Some may be used as a preservative by killing or preventing the growth of harmful bacteria (SD 1998). Spices may be taken from the roots, flowers, flower bud, seeds, root bark, inner bark (cambium), berries, or pericarp, as well as the leaves and other parts. Many of the plants providing spices come from tropical Asia, East Indies, and the Caribbean. Spices tended to be dried and often ground or grated into a powder. Small seeds, such as fennel and mustard seeds, are used both whole and in powder form. Some spices are obtained from the essential oils. Spices sometimes are used for other purposes than culinary. Turmeric is also used as a preservative; licorice as a medicine; garlic as a vegetable; and nutmeg as a recreational drug. In some cases they are referred to by different terms. Recent studies have show several spices to be effective at killing bacteria, with particular antimicrobial properties attributed to garlic and clove, as well as onion, allspice, and oregano, and to a large extent also thyme, cinnamon, tarragon, and cumin (SD 1998; Melgares 1998). Spices and herbs are both used to flavor food and sometimes the terms are used interchangeably. The term herb actually has two very different meanings. In botany, a herb technically is a seed-bearing plant that does not produce a woody stem with persistent tissue but generally dies down to the ground level each year. That is, it is a "herbaceous plant." In a more popular sense, the term herb is applied to any useful plant that is employed for culinary purposes in small quantities related to flavor (such as a condiment or seasoning), or for medicinal purposes, or even for spiritual uses. Likewise, the term refers to the substance obtained from the plant and used in that manner. In this non-botanical sense, the term herb generally is used regardless of whether the source of the herb is a woody plant or a herbaceous plant. For example, rosemary (Rosmarinus officinalis) is used in traditional Mediterranean cuisine and medicinally as a "herb" despite the fact that it is a woody, perennial plant. However, some limit the term herb even in the second sense of the term to herbaceous plants, particularly as related to culinary use (Spicer and VanDyk 2003; Herbert 2006). More specifically, some make a distinction between spices and herbs based on what part of the plant is the source and the type of plant. Herbert (2006) and Spicer and VanDyk (2003) consider herbs to come from the leafy part of a herbaceous plant, while spices are obtained from the seeds, berries, bark, root, fruit, or other parts of the plant (even leaves in some cases) of either a herbaceous or a woody plant. For example, cilantro is a herb because it comes from the leaves of Coriandrum sativum while coriander is a spice because it comes from the seeds of the same plant (Spicer and VanDyk 2003). Dill seeds are considered a spice, while dill weed is a herb derived from the stems and leaves of the plant (Spicer and VanDyk 2003). Furthermore, the preparation and use are sometimes considered in drawing distinctions. Both herbs and spices can be dried. However, some herbs, such as basil or oregano, may be used fresh, and are commonly chopped into smaller pieces. Spices are not commonly thought of as being as fresh as herbs (Herbert 2006). Herbs are often used in larger amounts, with spices considered more potent and stronger flavored and thus used in smaller amounts (Spicer and VanDyk 2003). Some spices are used as a preservative, not just for flavor. Even the location of the plant is sometimes used in drawing a distinction, with herbs found in many places and in particular originating in temperate climates such as Italy, France, and England, and spices native to warm tropical climates such as the Far East (Herbst 2006; VanDyk 2003). These distinctions, which are not precisely drawn nor universally accepted, are more distinctions made in terms of the culinary use of the terms. Herbal medicine, for example, utilizes many sources of plant matter. Salt is a very common seasoning. Because of its granular form, it is often mistakenly considered to be a spice. It is in fact a mineral product. Leaves and/or branches of aromatic plants; all or part of the plant can be used. Examples include basil, bay leaf, parsley, tarragon, and thyme. Ripened fruits or seeds of plants. Examples include dill, fennel, mustard, and black pepper. Roots or bulbs of certain plants. Examples include garlic and ginger. A kitchen shelf of spice. The spice trade developed throughout the Middle East in around 2000 B.C.E. with cinnamon, Indonesian cinnamon, and pepper. A recent archaeological discovery suggests that the clove, indigenous to the Indonesian island of Ternate in the Maluku Islands, could have been introduced to the Middle East very early on. Digs found a clove burnt onto the floor of a burned down kitchen in the Mesopotamian site of Terqa, in what is now modern-day Syria, dated to 1700 B.C.E. (Buccellati and BucBuccellati 1983). In the story of Genesis, Joseph was sold into slavery by his brothers to spice merchants. In the biblical poem "Song of Solomon," the male speaker compares his beloved to many forms of spices. Generally, Egyptian, Chinese, Indian, and Mesopotamian sources do not refer to known spices. In South Asia, nutmeg, which originates from the Banda Islands in the Moluccas, has a Sanskrit name. Sanskrit is the language of the sacred Hindu texts, revealing how old the usage of this spice is in this region. (The Moluccas or Maluku Islands are also known as the Spice Islands and are an archipelago in Indonesia.) Burkill (1966) estimates that nutmeg was introduced to Europe in the sixth century B.C.E. The ancient Indian epic of Ramayana mentions cloves. In any case, it is known that the Romans had cloves in the first century C.E. because Pliny the Elder spoke of them in his writings (Taylor). Indonesian merchants went around China, India, the Middle East and the east coast of Africa. Arab merchants controlled the routes through the Middle East and India until Roman times with the discovery of new sea routes. This made the city of Alexandria in Egypt the main trading center for spices because of its port. Spices were among the most luxurious products available in Europe in the Middle Ages, the most common being black pepper, cinnamon (and the cheaper alternative cassia), cumin, nutmeg, ginger, and clove. They were all imported from plantations in Asia and Africa, which made them extremely expensive. From the eighth until the fifteenth century, the Republic of Venice had the monopoly on spice trade with the Middle East, and along it with the neighboring Italian city-states. The trade made the region phenomenally rich. It has been estimated that around 1,000 tons of pepper and 1,000 tons of the other common spices were imported into Western Europe each year during the Late Middle Ages. The value of these goods was the equivalent of a yearly supply of grain for 1.5 million people (Adamson 2004). While pepper was the most common spice, the most exclusive was saffron, used as much for its vivid yellow-red color as for its flavor. Spices that have now fallen into some obscurity include grains of paradise, a relative of cardamom, which almost entirely replaced pepper in late medieval north French cooking, long pepper, mace, spikenard, galangal, and cubeb. A popular modern-day misconception is that medieval cooks used liberal amounts of spices, particularly black pepper, merely to disguise the taste of spoiled meat. However, a medieval feast was as much a culinary event as it was a display of the host's vast resources and generosity, and as most nobles had a wide selection of fresh or preserved meats, fish or seafood to choose from, the use of ruinously expensive spices on cheap, rotting meat would have made little sense (Scully 1995). The control of trade routes and the spice-producing regions were the main reasons that Portuguese navigator Vasco Da Gama sailed to India in 1499. Spain and Portugal were not happy to pay the high price that Venice demanded for spices. At around the same time, Christopher Columbus returned from the New World, he described to investors the many new, and then unknown, spices available there. It was Afonso de Albuquerque (1453–1515) who allowed the Portuguese to take control of the sea routes to India. In 1506, he took the island of Socotra in the mouth of the Red Sea and, in 1507, Ormuz in the Persian Gulf. Since becoming the viceroy of the Indies, he took Goa in India in 1510, and Malacca on the Malay peninsula in 1511. The Portuguese could now trade directly with Siam, China, and the Moluccas. The Silk Road complemented the Portuguese sea routes, and brought the treasures of the Orient to Europe via Lisbon, many of which were spices. Burkhill, I. H. 1966 (orig. 1935). A Dictionary of the Economic Products of the Malay Peninsula. Kuala Lumpur: Ministry of Agriculture and Co-operatives. Herbert, S. 2006. Spices versus herbs: What's the difference? Ezine Articles. Retrieved December 2, 2007. Melares, P. J. 1998. Common kitchen spices kill E. Coli O157:H7. Kansas State University Research and Extensino August 18, 1998. Retrieved December 4, 2007. Science Daily (SD). 1998. Food bacteria: Spice survey shows why some cultures like it hot. ScienceDaily Mar. 5, 1998. Retrieved December 4, 2007. Spicer, F. and J. VanDyk. 2003. Herbs vs. spices. Integrated Pest Management at Iowa State University. Retrieved December 2, 2007. Taylor, P. M. n.d. Introduction. F.S.A. de Clercq's Ternate: The residency and its sultanate. Smithsonian Institution Libraries. Retrieved December 4, 2007. This page was last modified on 9 January 2009, at 15:21.